The weather is starting to warm, the kids are finishing March break—for a sports fan it can only mean one thing: it’s time to fill out brackets. Each year, millions of people fill out their NCAA basketball brackets in anticipation of one of the premier sporting events of the season. Even in Canada, this distinctly American event is the main topic around water coolers across the country. What few people realize, though, is that the CIS stages a tournament with a similar format to the NCAA. The difference between the two is that while the NCAA men’s basketball tournament is a highly-anticipated, money-generating machine that airs on national networks, the CIS tournament passes in relative obscurity and requires hiring a private investigator to find the games on television or the Internet. Undoubtedly, the NCAA is a higher-quality game at the top of the brackets. 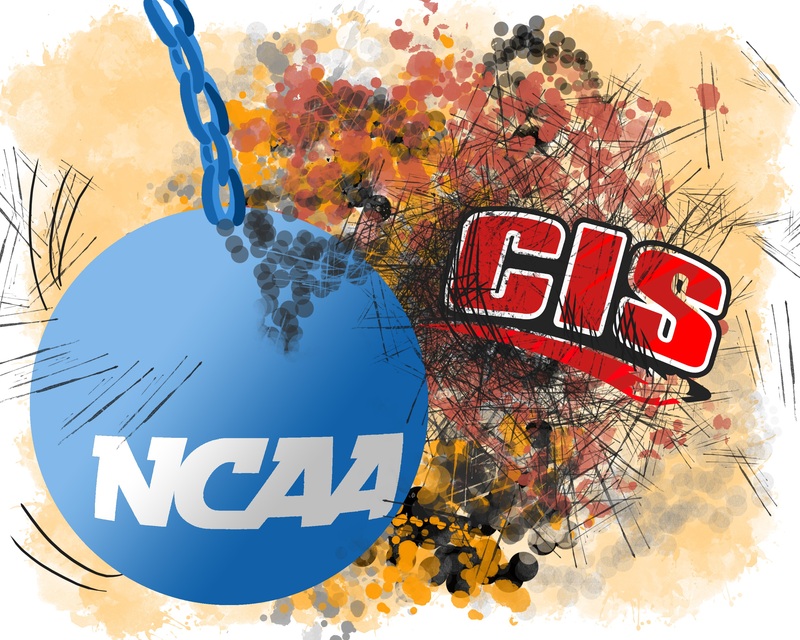 However, several CIS teams, Concordia included, play preseason games against NCAA Division-I opponents and the games are often very competitive, with CIS teams winning a fair amount. So while Canada may not have premier programs like North Carolina and Kentucky, the quality of CIS basketball is definitely watchable. It could also be argued that name recognition plays a factor, but for every Duke or Kansas in the NCAA tournament, there is a Murray State or Gonzaga. Which school do you think Canadians could tell you more about between Carleton or Wichita State? Likewise, most Canadians hardly watch any NCAA basketball during the regular season, so with the exception of a few premier prospects, NCAA basketball players are just as unknown to the average Canadian viewer. Concordia men’s basketball coach John Dore has been at the school for 22 years and made 12 appearances in the national championship tournament and believes the lack of attention to the CIS tournament is due in part to national insecurity. Perhaps the biggest draw to the NCAA though has nothing to do with quality of play or notoriety of schools and players involved. It really comes down to one thing: The Bracket. The format of the NCAA tournament is just really, really fun. It is simple and allows anyone—from the college hoops fanatic who can tell you the name of Norfolk State’s coach’s dog to an 81-year-old woman who thinks Duke is the new rapper her grandchildren enjoy—to make predictions and have the same chance of winning whichever pool or friendly bet they may be involved in. The fact that the NCAA tournament also features 64 teams, opposed to eight in the CIS tournament, is a huge advantage. You can design an office pool knowing that everyone’s bracket will be different. It also leaves more opportunity for the always marketable “Cinderella Story.” Sure, the final four teams remaining in the NCAA are usually the higher seeds in the tournament, but the fact is that no matter how good a team is, they can have their season completely uprooted because Insert-Name-Here State’s point-guard played the best game of his life. In Canada the stories are not as compelling. The few number of schools in the CIS limits the tournament’s capacity. As a result, only the top eight schools in the country make the tournament so there is no true sense of an underdog that came out of nowhere. If the best two teams win their first-round games, any possibility of even a marginally compelling underdog story is out the window. Also, the tournament takes place in just one weekend (compared to the three-week marathon down south) so it is hard to get attached to any team in particular or get to know the players. As enjoyable as CIS basketball can be to watch, the fact remains that no matter how the league is marketed or how much the quality of play improves, Canadians will always prefer to watch Duke vs. North Carolina over any other Canadian university matchup.